VCarve includes a comprehensive set of drawing tools along with profiling, pocketing and drilling toolpaths for 2D work. It also has; v-carving, prism carving, texturing and many more options for cutting 2D and 3D parts with your CNC. VCarve is a complete solution for 2D & 2.5D CNC routing. 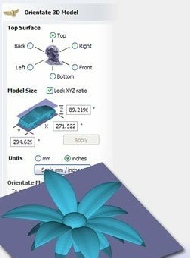 The software can also import and toolpath a single 3D model from another design program (STL, OBJ, SKP, 3DM etc.) as well as assembling multiple Vectric 3D Clip Art files (V3M). The software uses the same simple and intuitive work-flow and interface as Vectric's other programs. The software comes in two variants, Desktop for hobby users with smaller CNC machines (under 25" x 25" or 635mm x 635mm) and Pro which has no size limit and also includes production orientated features like Nesting, Toolpath Templates, Scripting (Gadgets) and Job Setup Sheets. 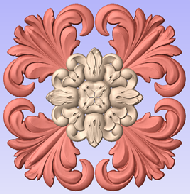 production routing and in addition has the ability to create 3D relief models from 2D data. Aspire's unique 3D component modeling coupled with the comprehensive set of 2D design and editing tools make it easy to work with existing 2D data or imported 3D models as well as giving you the ability to create your own 2D and 3D parts from scratch. Dimensional shapes can be created, edited and joined to build your final design. 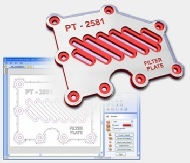 In addition you can import and modify existing 3D data and clipart, this can be combined with 2D data and a large selection of toolpath options to enable your CNC to make a huge range of parts.